Pixar has released details of some of the features coming up in RenderMan 21, the next release of its heavyweight production renderer, including GPU-accelerated Denoise and support for Open Shading Language. In its latest community newsletter, Pixar describes RenderMan 21 as a “game-changer and the biggest RenderMan release in years”, including over 60 new features. Of the 60, the newsletter only lists nine, but there are some interesting things in there, including GPU support for Denoise, the so-called “make pretty” button introduced in RenderMan 20. Denoise enables users to set lower sampling values for raytracing renders, resulting in a faster but noisier raw image, which Denoise then cleans up as a post-process. Pixar cited a speed boost of 2-10x for the original CPU-based implementation of Denoise over simply cranking up the sampling values, so it will be interesting to see how much difference the GPU makes. Other notable features include support for Open Shading Language, developed at Sony Pictures Imageworks, and currently supported in Arnold, V-Ray and Blender’s Cycles renderer. The newsletter also mentions new materials and lighting workflows featuring the same presets used in production at Pixar; improved displacement; and performance boosts when rendering volumes. Of the bridging plugins to other DCC tools, the user interface of RenderMan for Maya gets a “comprehensive redesign”, and RenderMan for Katana gets an “improved live render experience”. 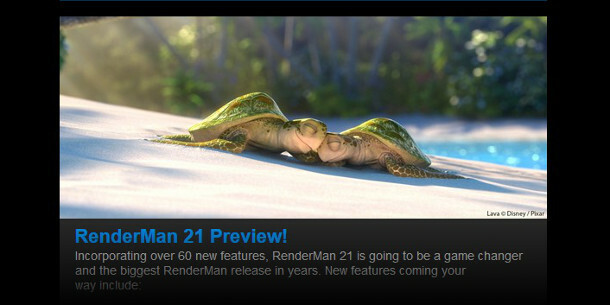 RenderMan 21 will “soon be made available” in beta to all commercial customers on active maintenance contracts. You can apply to join the beta program via the link below. RenderMan 20, the current commercial release, is available for 64-bit Windows 7+, Mac OS X 10.7+ and Linux. The renderer is compatible with Maya 2014 and above and Katana 2.0. Individual floating licences of RenderMan cost $495, and the software is also free for non-commercial use. If you have fewer than five commercial licences, Pixar is currently offering five more licences for $495, including free upgrades to version 21.